The weather is turning noticeably cooler, the leaves are changing, and it’s time to snuggle underneath fluffy quilts. It’s this kind of weather that gets me in the mood to start a new quilt. 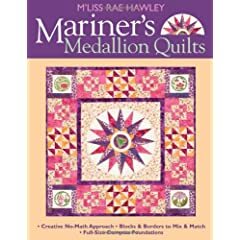 So, it’s only fitting that today’s review is on a quilting book – M’Liss Rae Hawley’s latest title, Mariner’s Medallion Quilts. Now that I’ve tackled my first paper piecing project, I can understand why this particular technique is so popular. You’re able to produce perfectly formed, intricate designs without having to cut precise pieces or best of all, do math. That is exactly what Mariner’s Medallion accomplishes. Never paper pieced before? No problem, M’Liss walks you though (both through pictures and written directions) all the steps so you get a perfect compass point every time. Keep in mind that although there isn’t any math involved, there is still lots of cutting. M’Liss also includes a very helpful section on selecting fabrics that help make your mariner’s medallion stand out by selecting fabrics that have a variety of values. To top it off she adds extra ‘pow’ to the quilts by giving tips for using design in your center circle – either by interesting fabric placement, machine embroidery, or by adding embelishments. But the book doesn’t quit with just the compass point. It also gives a ton of ideas on how to use it – pillows, clothing, and of course, a huge varitey of quilts ranging from wall to bed size are discussed. The center medallion is only the starting point. M’Liss adds houses, trees, sunrises, boats, lighthouses, bargello borders, and a variety of stars and designs to the borders (all of which have included instructions) which is not only beautiful, but adds so much interest to the quilt. Honestly, there is so much information included in this book, it’s hard to cover it all. Like most quilting titles, the book itself is softcover. All the pattern and templates can be found in the back of the book, however, you are responsible for tracing them off yourself. Mariner’s Medallion Quilts also includes numerous color photographs – some instructional, some informational, and some inspriational! If you’re interested in sewing quilts, especially the paper piecing kind, this book is definitely worth checking out. This entry was posted in Book Reviews, Quilting on September 27, 2006 by stacy. I didn’t realize you were a quilter! Cool. I find paper piecing a little tedious but the results, expecially with multiple, sharp, points are worth it. I am sending you a couple pics of my own quilts since you share so much with all of us!